Ian Simpson and his wife Linda Simpson recently agreed to a custody deal to bring their granddaughter Alice to the UK, after being entangled in a grueling custody battle for months, according to media reports. After their son Michael Simpson was stabbed to death by his Chinese wife Fu Weiwei in an apartment in Shanghai in March 2017, 8-year-old Jack and 6-year-old Alice have been living with their maternal grandparents in Nanzhang county, located in Central China's Hubei Province. However, the British grandparents fought for custody of these two children. "Bringing the girl [Alice] back to her grandparents is the best result we could reach so far," Fang Jie, the lawyer of Simpson, told the Global Times on Wednesday. She refused to further comment on the case, which has been closely followed in media reports. A Weibo user going by the name of Spade J, who claimed to be a friend of the Simpson family, said in a post published on Tuesday that the British grandparents appreciate the latest judgment. However, some media reported that Simpson had blamed the Chinese judge for an unfair judgment. Spade said this is not true. The lawyer of the maternal grandparents refused to comment on the case when he was contacted by the Global Times. Michael Simpson moved to China while working for the retail chain Next, and met Fu, who used to run the company's shopping guide. They married in 2009, however this quick marriage did not end up well. After several years, the couple faced a crisis in their relationship and the marriage fell apart, according to Chengdu-based Red Star News. In March 2017, Fu showed up in Simpson's apartment and found out he was with his new girlfriend. The Chinese woman stabbed the British man to death while their two kids were sleeping at home. The case has sparked heated discussion on Chinese social networks. Some netizens suggested that the British grandparents should bring those two children back to the UK for better education, as the maternal parents live in a remote county. Others say going to the UK does not guarantee happiness to these two kids. Some expats living in Beijing for a long time with Chinese spouses and mixed race children told the Global Times many factors should be thoroughly considered in this case before it becomes much more sensational. "The citizenship of the child must be considered. If the child is not a Chinese citizen, then clearly the embassy should assist in ensuring the child is returned to the appropriate guardians in the UK," a British man who preferred not to be identified told the Global Times on Thursday. In this circumstance, both parents should have a legally binding agreement if accidents happen to one or both parents, he noted. According to information provided by Spade J, Jack has Chinese citizenship and a hukou, or household registration status, in Nanzhang county while Alice has British citizenship. Ian Simpson told the British media that he asked a number of times to visit the children and the maternal grandparents did not allow them to. "Before she [Fu] was sentenced, they wanted forgiveness and 63,000 pounds ($79,637) in advance," Simpson said in an earlier interview with ITV's This Morning. He also noted that the money would ensure the children would come back to visit their grandparents in China if the British family financed them. In transnational marriage disputes and custody battles, judges are likely to put human factors aside and stick to laws and regulations, Liu Yafei, a lawyer at Lantai Partners, told the Global Times on Thursday. "The child with British citizenship can go with British grandparents, which shows that the judge has fully considered the British grandparents personal feelings," she said. However, the best scenario is not keeping these two children apart, which requires more efforts from both British and Chinese families to reach agreement, the lawyer added. 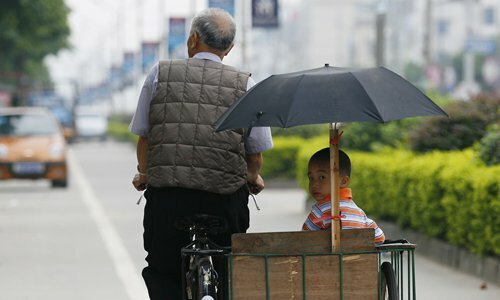 "Ideally, an agreement should be reached where the grandchild could be brought to the other grandparents periodically - perhaps once a year," the British expat living in Beijing said.